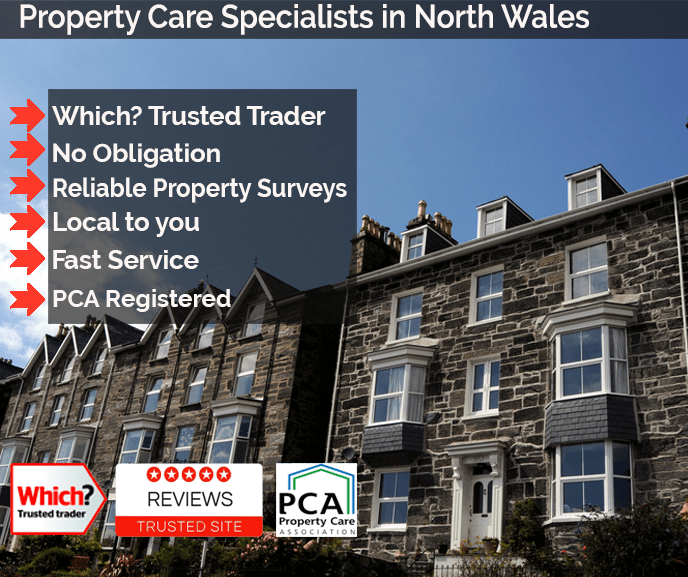 We have been providing property care and preservations services in areas across North Wales for over 50 years. These services include: damp proofing, woodworm treatment, dry rot treatment as well as radon gas. We have the best team across the country to help with your property care maintenance and ensure that all of our customers are left fully satisfied. Conwy is located in the North Coast of Wales and is a walled market town that faces the Deganwy across the River Conwy. The average precipitation is significant high throughout the year in Conwy and even in the driest months, there is still a large amount of rainfall. The wettest weather is at its peak during the months between October and December. This is where the potential for dampness occurring in your property will be at its highest. If your property is more than 40 years old then it is more than likely that your buildings damp proof course will be either damaged or not even have put in place. If you leave damp untreated for a long period of time then more serious issues can occur and this can cause further problems for you and your property. Health issues such as the risk of asthma can be increased from the exposure to black spot mould. Condensation, rising damp and penetrating damp can all lead to stains of the walls, peeling off the plaster and an unpleasant smell. Dry rot and wet rot can also be an outcome of dampness in your property. Both of these property care issues can cause serious damage to your building. Having someone who is inexperienced and not a qualified professional to treat your property then this will be a waste of time and money. We always recommend that you have a damp proof specialist carry out a survey at your property. At Timberwise are accredited with being members of the PCA, Which? Trusted Trader and BWA (Basement Waterproofing Association). This will give you the satisfaction that all works carried out at your property will be to the highest standards possible. You can trust Timberwise will provide the best solution for all your property preservation needs. Many of our customers in North Wales always ask the question of what goes into a timber and damp survey. The first procedure in the process is to book an inspection with a specialist. Always make sure when booking a survey it is from a PCA approved company to ensure that your property will be fully treated from any damp and timber issues. Once you have booked in the survey, the surveyor will assess all areas of the property. Pictures and notes will be taken at the inspection of outlining any potential issues and solutions to the property care problem. All this information will then be explained in the damp and timber report. The damp and timber report will then put forward the costs for any works that need to be carried out to solve the timber or damp issue. We are proud of our work and showcase work we have carried out in our case studies. One such case study looks at wet rot on a property on Anglesey. Our property care experts in North Wales were called upon to advise upon fungal decay found in a historic hotel in Beaumaris, Anglesey. Once the survey has been carried out by surveyors wet rot fungus was discovered in a bay window area. The extent of the wet rot was such that the timbers in the bay had been structurally weakened. The solution to the wet rot problem involved providing a caged area to the seating area beneath the bay and the decayed timber was removed from the bay and new timber sections were added in their place. For more information about the case studies we cover click here. TTimberwise is one of the leading property care companies in North Wales covering Wrexham, Rhyl, Colwyn Bay,Bangor, Anglesey, Caernarfon (Carnarvon), Bangor, Holyhead, Rhos on Sea and Valley, Peterstone Wentlooge, Duffryn, Bassaleg, Rogerstone, Newport, Bettws, Caerleon, Langstone and Underwood and many more. At Timberwise we carry out treatments for damp proofing, woodworm, dry rot for many high profile customers which include Conway Council, Denbighshire County Council and estate agents Dafydd Hardy. Having to deal with a damp and timber problem in your property can be quite a huge task to be faced with. At Timberwise, we aim to provide you with the very best service possible to make the process as stress-free as possible. Our timber and damp surveyors are on hand to provide expert advice for any questions you might have. You can get in touch with our friendly team by calling on 01492 849 056. You can alternatively fill our request a survey form in at the top of the page.